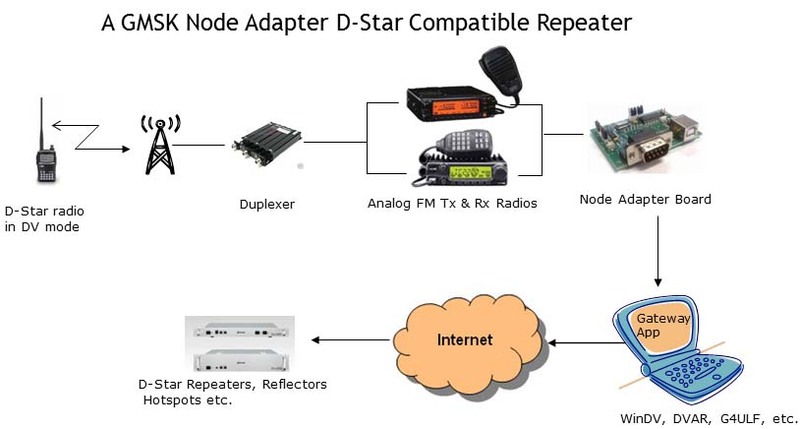 If you have a gmsk modem and put up a D-Star Compatible Hotspot, it is quite easy to convert this simplex system to a full duplex repeater that supports DPlus linking to other repeaters, reflectors and often to Hotspots, DVAPs and DV Dongles. With other software, this same equipment can become an ICOM G2-compatible repeater that supports Callsign Routing. Callsign -- I recommend you get a separate callsign for your D-Star Compatible repeater. This is required if your chosen software is the G4ULF StarGate gateway. While not absolutely required when using DVAR software, things will be simpler if your repeater has its own callsign, and if you later move to G4ULF StarGate, the callsign will already be set up. D-Star registration -- You need to register your club callsign with a nearby D-Star repeater, and set up at least one "terminal" with a blank "initial". This is documented on the Building a D-Star Compatible Hotspot page, Step 1. In Step 1.d, create the "blank" terminal. You can create a 2nd terminal with initial of "R", or you can keep it simple and just use the "blank" terminal for authentication. There really are no standards for this. Duplexer -- This is not a D-Star issue, since all repeaters require at least a duplexer. If you are setting up a "garage repeater" in a low-RF area, you can probably get away with an inexpensive "mobile" duplexer. I got mine on eBay from seller "mega409shop" for $90 tuned to my frequency pair and shipping included. Running 35 watts, I have experienced very little desense in the receiver. On eBay, search for "50W UHF Duplexer" or "50W VHF Duplexer". Prices will vary. Caution: Inexpensive duplexers normally provide about 75 db isolation between Rx and Tx. When running 50 watts or less, this is probably ok. This type of duplexer requires a split of at least 3.5 mHz for VHF, or 5.0 mHz for UHF. If you are hoping to get your repeater coordinated in the US, this split may or may not be acceptable to the coordinators. If your repeater will be located at a high-RF location, for example on a commercial repeater tower, an inexpensive duplexer will not work for you. You will need a high quality duplexer with 100 db or more isolation and possibly other equipment. You can get lots of info from the internet, such as Repeater-Builder website. Computer -- Your computer doesn't need to be large or fast. I started out using an older laptop, but decided since the PC would be on 24 hours a day, I should get something that consumes minimal power. I built a small, inexpensive PC using a Mini ITX form-factor motherboard. There are many which will work. I got an Intel BOXD510MO board with Atom CPU, 1 GB memory, for the "hard disk" I got a cheap 4 GB Compact Flash card and a CF SATA adapter. I already had a KVM switch so I use the same keyboard, monitor and mouse that my main computer uses. The entire cost of this PC was about USD 180. It uses 26 watts of mains power. Note: some people get an inexpensive solid-state disk unit. The goal is to have as few moving parts as possible. My software for now is DVAR Hot Spot, so I needed to load Windows to my new PC, and I wanted a slimmed-down Windows installation. In addition, since Compact Flash cards have a lifetime limit in write operations, I wanted Windows to avoid all hard disk writes during normal operation. This page explains how I did that. Software -- you have a choice, but for this page I'll assume you will use DVAR Hot Spot by Mark McGregor KB9KHM. You can get his software from http://www.dutch-star.eu/software/ -- scroll down to DVAR HotSpot and select the latest version. If you haven't already, refer to Step 5 on Building a D-Star Compatible Hotspot. Cable -- Since I already had a simplex hotspot with a gmsk board to radio cable, I built a simple cable that plugs into that cable and the two radios. From the local electronics store I got 1) a ps/2 keyboard/mouse extension cable (6 pin mini DIN female on one end, male on the other) and 2) another one, though any cable with a male 6 pin mini DIN on one end will work. I cut both in two and tossed one of the halves with a 6 pin male connector on it. I stripped insulation and used a VOM to identify which color wire went with which pin. So there are 3 cables, one with a female connector, two with males. The resulting Y-cable plugs into the end of the gmsk node adapter cable and the Y-pigtails plug into the Tx and Rx radios. Using the pin numbering shown here: 6 pin mini DIN connectors -- that is, both female and male connectors are facing you with the slot or notch at the top, wires coming out the back. Label one of the male cables Tx, the other Rx. Connect the female connector to the Hotspot cable from the gmsk node adapter board. Be sure to plug the male cable marked Tx into the transmit radio, and the one marked Rx into the receive radio. Tune the Rx and Tx radios to their respective frequencies, and depending on radio, set packet mode, etc. If using a radio that's never been in Hotspot or repeater service, check the Radio Files folder in the Files section of the gmsk_dv_node Yahoo Group website for advice on how to configure. Note: see Building a D-Star Compatible Hotspot, steps 3.a and 7, for info regarding RSSI Report. Most boards are configured for "version 4" mode, so RSSI Report should not be checked. If you have a NQSMHS board and have set the jumpers for V5 mode, then check RSSI Report box here. Then run NAWinTest and check out both the RF Read and the Echo Test functions. In the DVAR Hot Spot software, disconnect, then go to Edit/Settings. Fill in YOUR repeater's callsign (not the one in the screen shot) for Node Callsign. Choose the "Band Module" or port you plan to call it. For the Gateway Auth Callsign, if you created only the "blank" terminal, then fill in your repeater's callsign. If you created a 2nd "R" terminal, then enter your callsign, then enough spaces so "R" is in the 8th position. 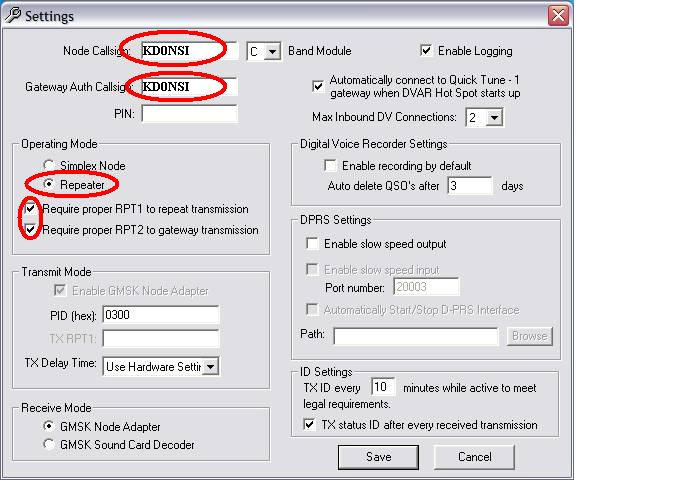 Set Operating Mode to Repeater, and check the Require proper RPT1 and RPT2 boxes. Transmit with a D-Star radio The repeater should repeat. NOTE when you let up on PTT, you may hear the last few words of the transmission come back at you. This is normal and is only heard by the person who just transmitted. You can also play with the Tx Delay setting in the firmware if you want. Note: I recommend you set DVAR's Callsign Server Settings to DUTCH*Star NLroot, so your repeater's callsign will show up on other DVAR hotspots who might want to connect or link directly to your repeater. There is also a trick that DVAP and Dongle owners can do so they will also see HotSpots and DVAR Repeaters. This trick is documented at DUTCH*Star DPNS (click on the DPNS button). Total incremental cost: $390 (new PC) or $210 (using spare PC) - in both cases using spare analog radios and an existing antenna and coax. D-Star® is a registered trademark used for communication equipment (repeaters and transceivers) for amateur radio communications, and owned by Icom Incorporated. Copyright © 2009-2017 James M. Moen. All rights reserved.